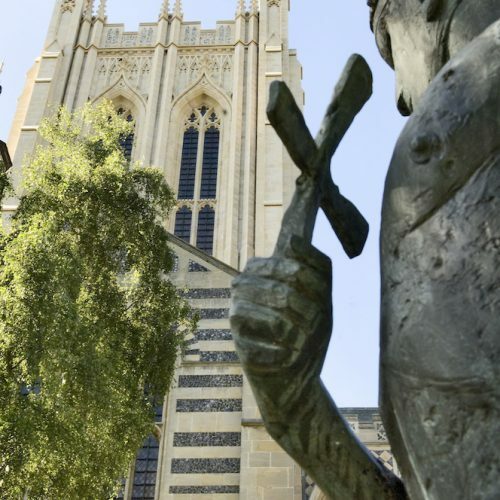 A warm welcome to everyone, following in the tradition of Benedictine hospitality offered in the 11th century by the Abbey of St Edmund to visiting pilgrims. 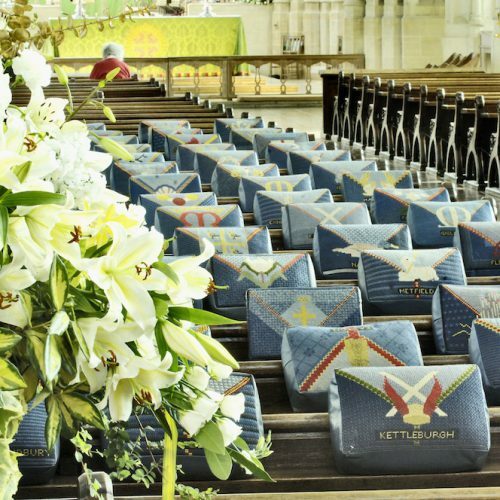 The unique collection of kneelers, two for every parish and each one bearing a different design, placed on the Suffolk ‘blue’ background. 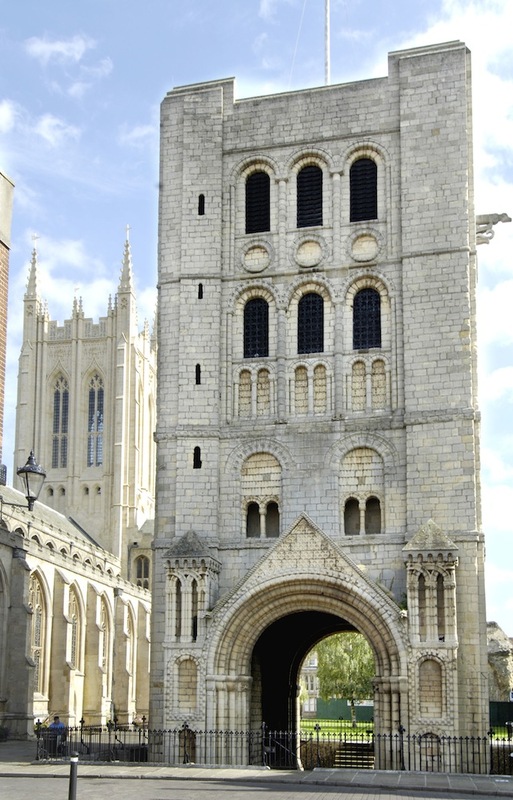 Almost a trick question because St Edmundsbury Cathedral is only 100 years old, becoming a cathedral in March 1914. But there’s been a church on the site for at least 1000 years, originally as the parish church of St Denys, then St James under Abbot Anselm, with the dedication of St Edmund being added in 2009. The building you see today was begun in 1503 and completed in 1551 though major restorations have taken place since. 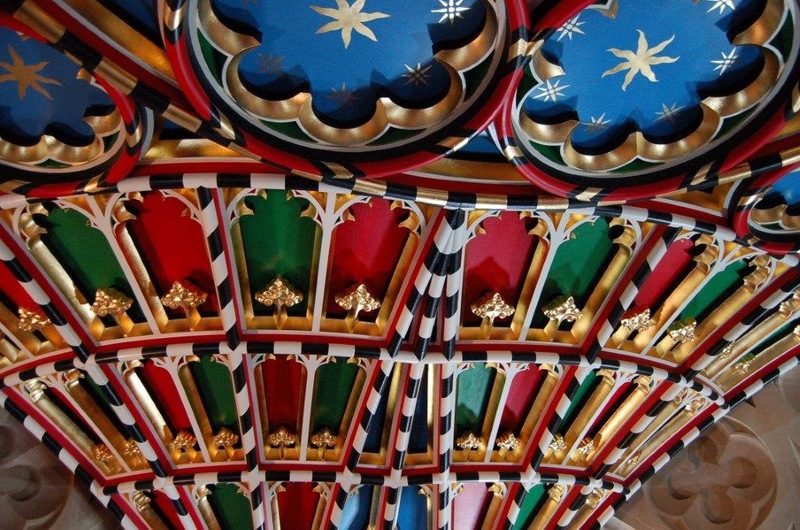 The Cathedral is open daily and you can take a guided tour, light a candle or enjoy the music. There’s no fewer than five choirs, despite there being no choir school. 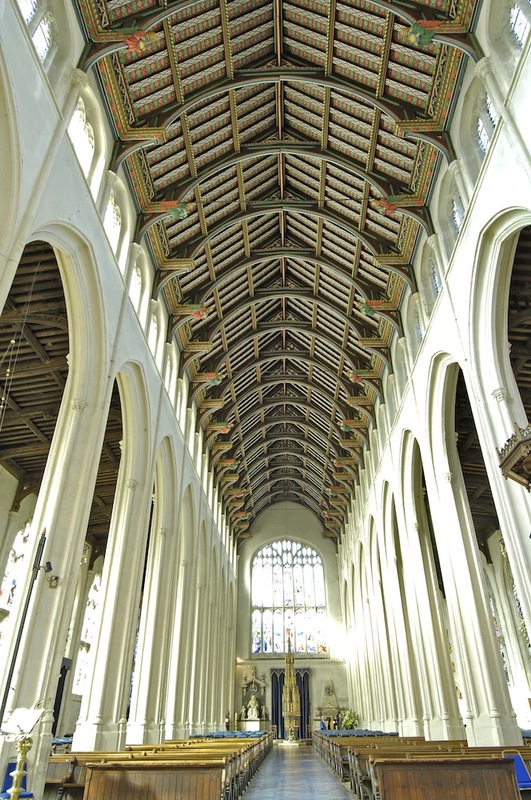 Check out the Cathedral website for details of tours, events and services. Pop into the Cathedral Shop for a huge range of gifts and cards. Open Monday to Saturday 10am-5pm and Sunday 11.30am-4pm. Eat and drink in the Pilgrims’ Kitchen, open Monday to Saturday. 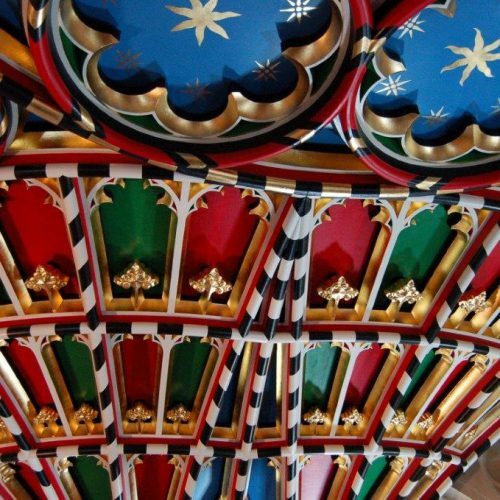 Get there from 8.30am for coffee and cake, take a tour of the cathedral and return for lunch. Head for the verandah or the garden on sunny days. The restaurant is licensed so you can linger over a refreshing drink with your meal. The neighbouring Edmund Gallery hosts a programme of exhibitions throughout the year by local artists. 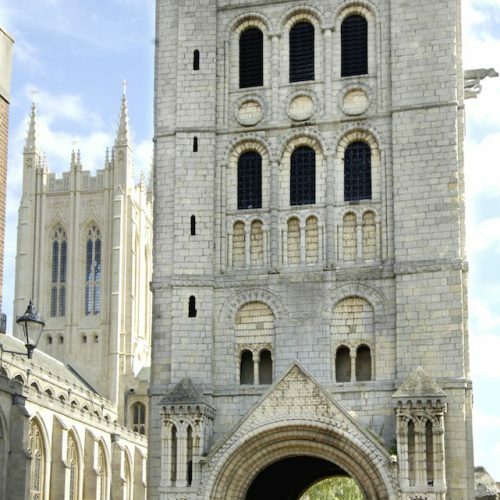 It was none other than King Canute who set up the mighty abbey in 1020 that housed the shrine of St Edmund, formerly England’s patron saint. No shrine to visit now but the compelling story lives on. 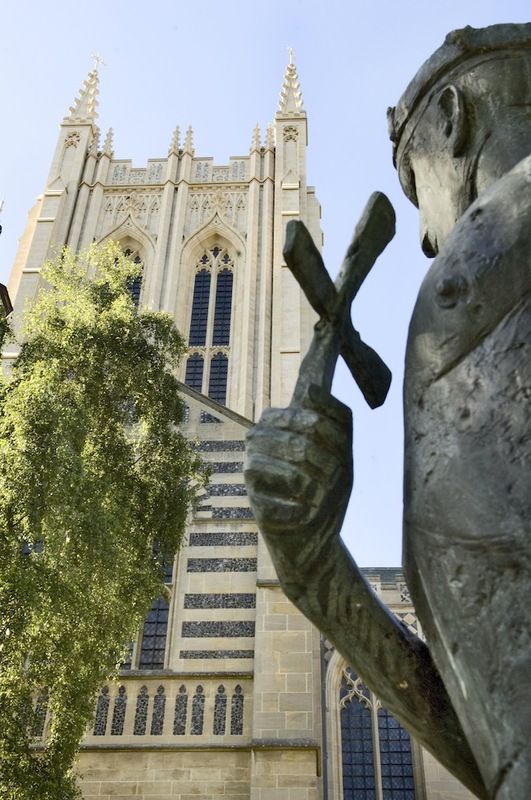 Look out for images of the crown of St Edmund with crossed arrows and of the wolf that’s said to have guarded his head when he was martyred by the Danes. Brian Whelan’s painting of the martyrdom hangs in the Lady Chapel. Explorer Bartholomew Gosnold, who founded Jamestown – the first English-speaking settlement in America – had his children baptised at St James. 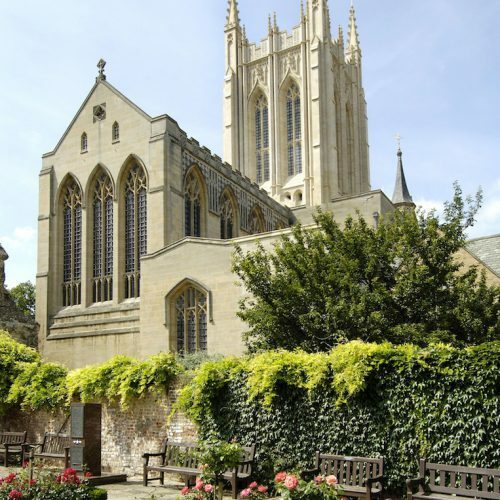 On an earlier visit, he named Martha’s Vineyard after his daughter who had died in Bury St Edmunds in 1598 and was buried in the Great Churchyard alongside the cathedral. 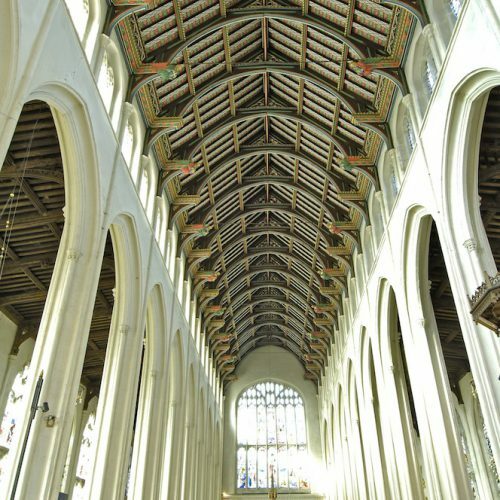 Bury St Edmunds is a Magna Carta Trust town because the barons allegedly met at the Abbey of St Edmund in 1214 and swore an oath to force King John to agree to a new charter, later known as Magna Carta. 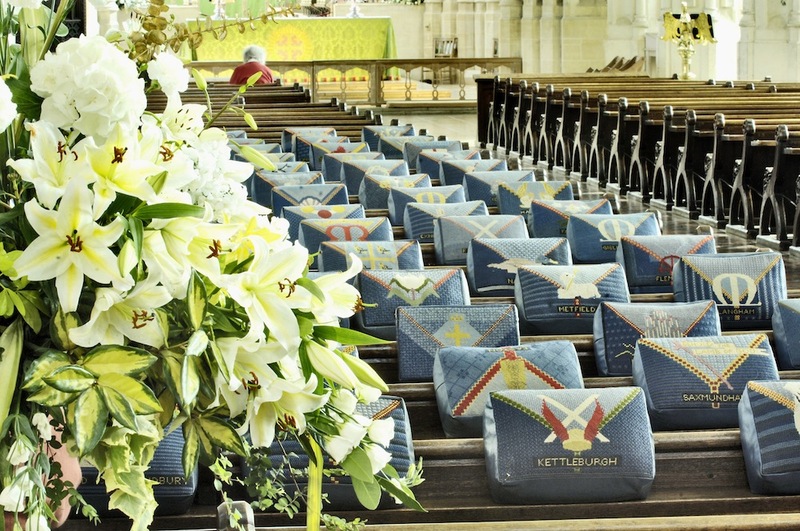 See the coats of arms of the Magna Carta barons in the chancel. HRH The Prince of Wales, called the Millennium Tower a ‘spiritual beacon for the new Millennium’. 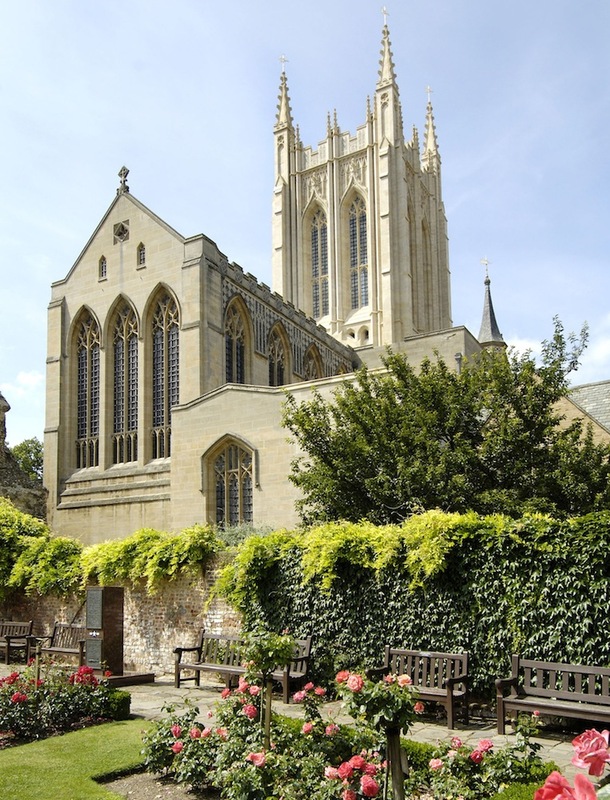 Wander through the award winning Abbey Gardens, open daily from dawn to dusk. On Angel Hill, you are a mere step away from tempting independent shops and lively cafés. Make your visit chime with colourful street markets on Wednesdays and Saturdays. Gen up before you go here.